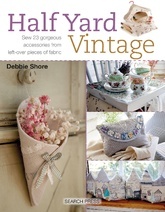 The latest addition to the popular Half Yard series, this is another fantastic sewing title from Debbie Shore, this time with a gorgeous vintage theme. The book features 23 beautiful, vintage-style items to sew that will bring a touch of elegance to the home and make wonderful gifts for friends and family. It contains beautiful accessories including a lacy pillow cover, a bucket-style wash bag, a dressing table cover and cones for displaying posies of dried flowers; gorgeous projects perfect for an afternoon tea such as a tea cosy, made-to-measure tray cover and a cake frill; and accessories for a vintage Christmas. Using half-yard pieces of fabric and Debbie's friendly, easy-to-follow advice, vintage style has never looked better!